Thanks to steady rain Sunday, the Essex Region Conservation Authority has revised its flood watch to a flood warning. 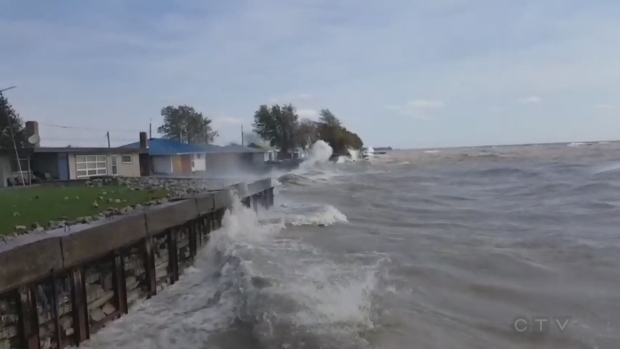 The warning is in effect for the east shoreline areas of Leamington and the north and east shorelines of Pelee Island. It also extends into areas of the western basin of Lake Erie and the mouth of the Detroit River. Affected municipalities could include Leamington, Kingsville, Essex and Amherstburg. Along Lake St. Clair, impacted communities include Lakeshore, Tecumseh and the eastern limits of Windsor. Wind speed and direction will have the effect of elevating water levels in tributary rivers draining into the western basin of Lake Erie and the Detroit River. Elevated water levels along with increased wave activity increases the possibility of nearshore erosion and breakwall damage and wave over topping with splash and spray. The warning is in effect until Mondat at 10 a.m. and the ERCA continues to monitor the situation.